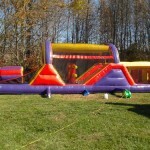 Ninja Jump’s Backyard Obstacle Challenge offers 40 feet of challenge obstacle entertainment in one unit. This inflatable play structure takes participants on a larger journey through tunnels, around horiztontal and vertical pop-ups, with plenty of climbing and descending along the way! This sleek, low-profile Backyard Obstacle Challenge provides a bright, purple, yellow and red primary-colored theme and its arching design will attract attendees and keep them entertained. 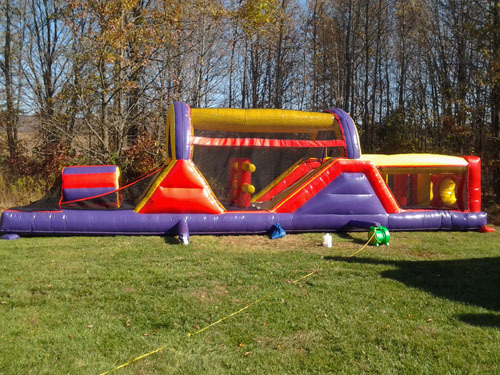 This inflatable obstacle course measures 40′ long by 11′ wide by 12′ tall and begins with a front-loading obstacle entrance, taking participants through tunnels and pop-ups to facilitate maneuvering skills and build confidence. The challenge obstacle then leads to an exciting front-exiting climb and slide, all to guarantee hours of enjoyable physical activity. Each inflatable play structure has mesh windows for easy viewing, and is constructed of the fire-resistant, lite n’ strong™ vinyl for easy portability, durability and safety.